BASCAP engages with a range of actors to formulate best practices for their respective roles and responsibilities in relation to counterfeit goods, building on the recommended practices detailed in the report Roles and Responsibilities of Intermediaries: Fighting counterfeiting and piracy in the supply chain. Criminal networks take advantage of container shipping to transport huge volumes of counterfeit products, affecting virtually every product sector. According to one report, US$461 billion in counterfeit goods moved through international trade in 2013, with close to 10% shipped on maritime vessels. 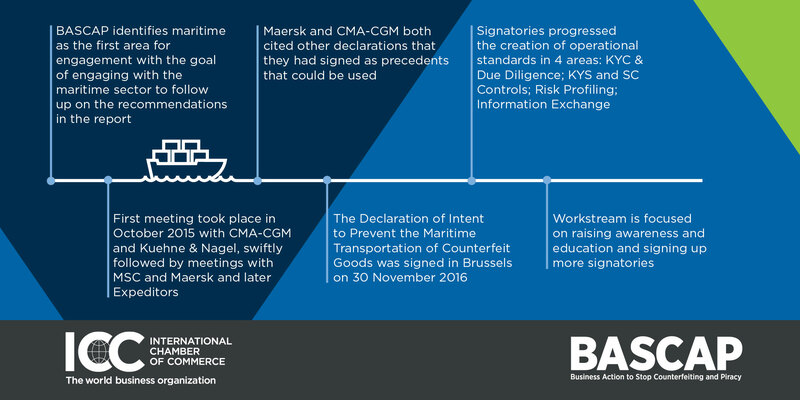 In 2016, brand owners and representatives from the international shipping industry signed a historic Declaration of Intent (DOI) aimed at preventing the maritime transport of counterfeit goods. 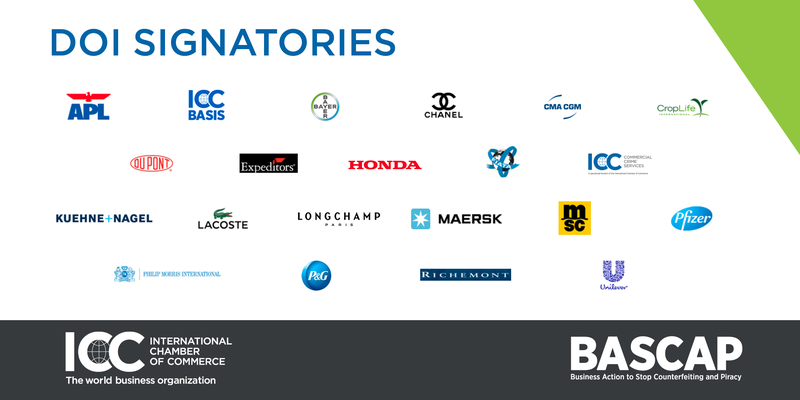 Along with ICC BASCAP, initial signatories included leading global shipping firms and freight forwarders, alongside 10 major multinational brand manufacturers. Signatories of the DOI acknowledge the destructive impact of the global trade of counterfeits, condemn counterfeiting activities, recognise the wider problem of illicit and illegal trade, and commit to promoting the DOI across relevant industries. They also declare that they will not knowingly facilitate or tolerate the carriage of counterfeit products. In March 2018, a paper was published by DOI signatories detailing recommended, voluntary best practices in Know Your Customer for maritime operators. Similar papers are being developed by the signatories in other key areas. Criminal networks are taking advantage of express carriers to transport massive volumes of counterfeit products, affecting virtually every product sector. According to statistics published by the EU and US Governments, counterfeits transported in containers is greatest in terms of value. However, the highest number of shipments enter the US and EU via couriers and post. Raise awareness of the counterfeit issue within the express carrier industry. Landlords should take steps to ensure their tenants are not engaging in illegal activities. BASCAP’s paper Measures to Engage Landlords in the Fight against Counterfeit and Pirated Goods: Best Practices for Landlords, Governments and Enforcement Agencies addresses a wide range of challenges faced by landlords and presents measures designed to assist them in keeping fakes out of their facilities. Such measures include sustained due diligence checks and implementation of strict policies in physical markets as well as increasing cooperation with brand owners to facilitate the detection of infringing goods. The paper contains model provisions for landlords to include in their lease agreements to ensure that tenants who engage in counterfeit and pirated goods face extreme consequences including termination of the lease, eviction and forfeiture of the deposit amount. Government action is required to clarify the conditions under which a landlord may be liable for tenants engaging in counterfeit and pirated goods and to enforce sanctions against landlords who fail to take appropriate actions to deter intellectual property-infringing activities on their premises. Enforcement agencies should conduct regular and sustained enforcement actions and promote and implement voluntary programs for landlords to avoid the renting of premises to criminals engaging in counterfeit and pirated goods.